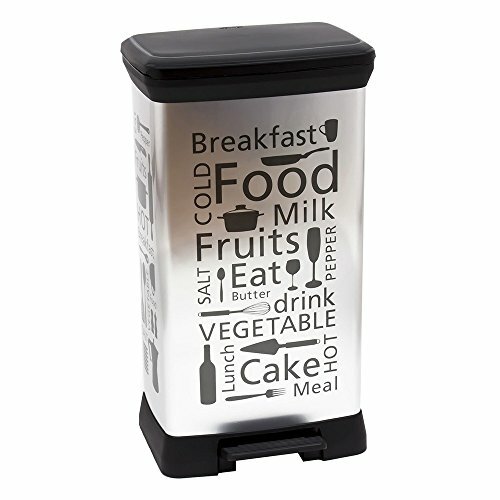 What Is The Best Kitchen Bin On The UK Market? The most important thing to consider when you are buying a new kitchen bin is size. 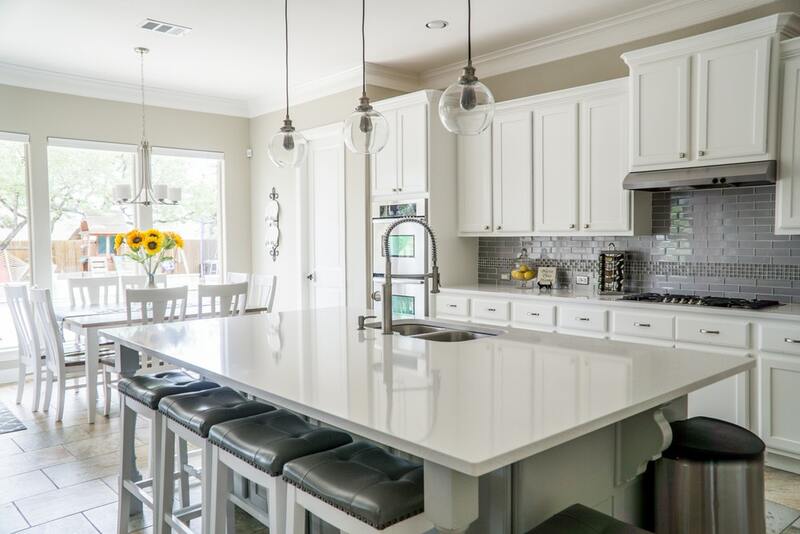 You’ll want something that is big enough for your kitchen waste but not too big that it takes over half of your kitchen. Also consider whether you need a split bin for recycling. See all features that matter when buying a kitchen bin below. We have also reviewed 5 of the best kitchen bins you can buy online. We’ve selected different sizes so you can easily find the right one for your needs. They are all easy to use with simple and reliable opening mechanisms. Several of them are recycling-friendly. 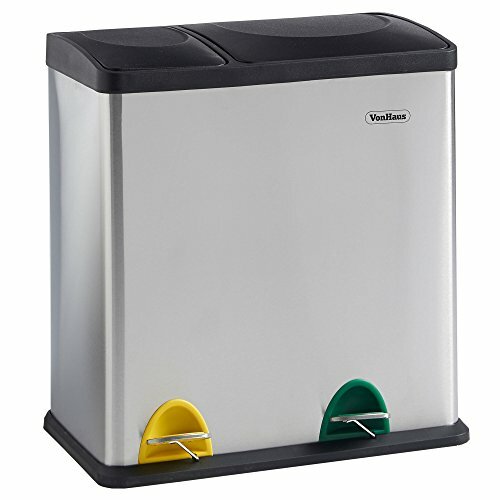 Kitchen bins range in capacity from as little as 15 litres to as big as 60 litres or more. The best capacity will depend on how many you are in the house and how much kitchen waste you generate. For a home of 1-2 people, get a 15-30 litre bin. For 2-3 people, a 30-40 litre bin is perfect. A larger 40-50 litre bin is great for households of 3-4 people. For big households or if you don’t want to empty the bin often, get a 50+ litre bin. Note: If you are getting a bin with multiple compartments, get a big one since the total capacity will be split into two. You need to make sure each compartment is big enough for whatever type of waste you’ll put in. Next, check the dimensions and design of the bin. If you don’t have a lot of space, get a slim and tall bin with a small footprint. Also consider the design and aesthetics of the bin. Most kitchen bins come in a shiny stainless steel finish. They look great and blend well in most kitchens. If you want a bit style, there are bins that come in interesting colours like red, black and grey. It’s up to you what you want. Get a bin that’s easy to open even with your hands full. Pedal bins and touch bar bins are the easiest and most convenient to use. Traditional lidded bins are also good though a bit inconvenient since you have to lift the lid up with your hands. Are you planning to recycle your kitchen waste? If you do, or it is a requirement in your council, look for a kitchen bin with at least two compartments. Some can have up to three. You can then designate each compartment for a specific type of waste. In most cases, you can open the compartments individually meaning you don’t have to open the whole bin every time. The compartments can either be split 50:50 but you can also get a bin where one is slightly smaller the other. If your recycling waste is not as much, get a bin with one compartment bigger than the other. This will ensure you have enough space for your normal kitchen waste. If you generate a lot of kitchen waste, you need a large bin that you won’t have to empty every day. 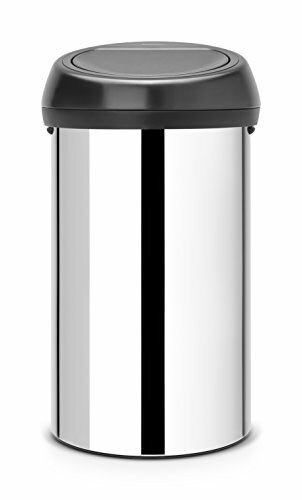 This 60-litre Brabantia touch bin is perfect. It is more expensive than you would normally expect for a waste bin but you’d surprised how much of a difference a few extra thoughtful features make in the kitchen. One of the things you’ll love most is the wide opening. It makes it super easy to empty waste from pans and plates without creating any messes on the floor. The lid opens quietly and smoothly with just a light touch. It also closes quietly; no banging sounds. The bin perfectly fits any 60L bin liner. You can also order a pack of 30 liners from Brabantia when you buy this bin. Note that the bin has no plastic insert. To remove the waste, you lift the full liner out of the bin. Use a quality bin liner to ensure it doesn’t split can cause a big mess. 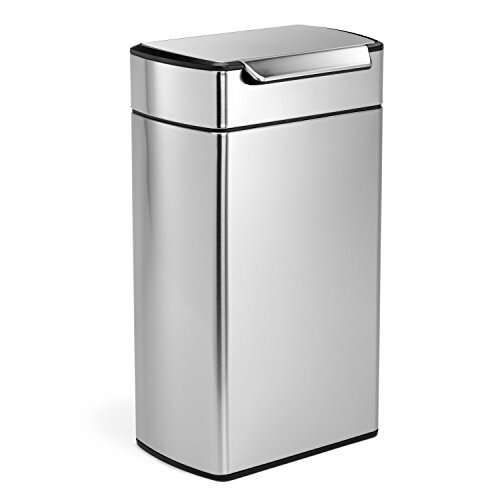 The bin is finished with a shiny fingerprint-proof stainless steel exterior. You can also get it in other colours including red, metallic mint, matt black and matt steel among others. Extra-large capacity which is great for busy kitchens. A ring at the base to protect your floor. simplehuman sells some really good kitchen bins. They are a good alternative if you don’t want to get a Brabantia. This one is one of the most popular ones though the price tag is a bit high. It has a unique rectangular shape and a beautiful stainless steel finish. It is fingerprint-proof so don’t worry about smudges. At 40L, it’s perfect for even the busiest of kitchens. There’s also a smaller 30L size available. The lid opens using a touch-bar mechanism. It requires just the lightest of touches to open with your hand, elbow, hip or knee. The lid opens quietly to a wide angle, ensuring you have a big opening to put the trash through. No spills on the floor. You can use any 40L liners in this bin or buy custom fit ones from simplehuman. Whichever you use, they are easy to fit into the bin. There’s an inner plastic bucket which you lift and put in park position. Then you fit the liner inside it and push it back down. The liner overhang is hidden by the lid so the bin looks neat and clean. Emptying the bin is super easy. The inner bucket comes completely out of the bin which makes it much easier to empty waste. Easy to use touch bar. If you are looking for a split bin for your normal kitchen waste and recyclable waste, this is a great choice. It has a total capacity of 60L with a 50:50 split between the two compartments. Each 30L compartment has its own lid and foot pedal meaning you only open the compartment you want to put waste in. Each also has a removable inner bucket with a handle which makes emptying a breeze and mess-free. Many customers say they had to get 50L liner bags to ensure a good fit. 30L liners are a bit too small for the deep bin. There are also a few complaints that the pedals feel a bit flimsy and may not last very long so use with care. But for the price, this bin is worth it especially considering it’s a split design. It comes in several finishes including fingerprint-proof steel, cool grey, red, white and cream. Removable inner bucket with handle. 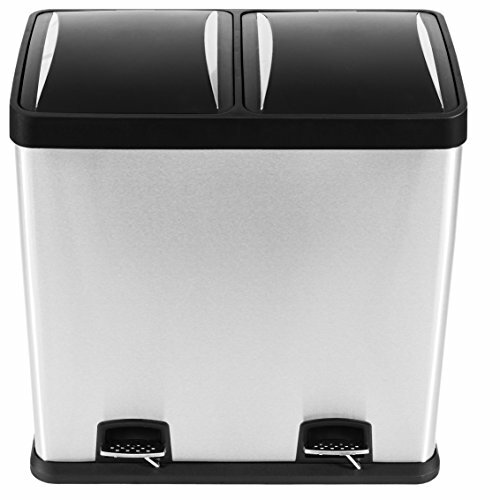 If you are looking for a smaller or cheaper split design kitchen bin, get this one by VonHaus. It has a total capacity of 36L which is on the smaller side but perfect for homes with 1-2 people. It’s also great for office kitchenettes. The capacity is split into two compartments: 24L and 12L. You can use the included stickers to identify which compartment is for recycling and normal waste. The exterior is stainless steel with a non-slip base. On the inside are two removable buckets which make emptying the bin easy. A normal bin liner fits easily inside the buckets though the overhang will be visible on the outside. Compact design for small kitchens at home or office. Split design for easy recycling. The included stickers are handy for quick identification. Removable inner buckets with handles for easy emptying. This one is a good choice for those who are looking for an affordable high-capacity bin. It is the only plastic bin on this list but it is surprisingly sturdy. The only part that feels a bit flimsy is the pedal so be gentle when you step on it. Since the exterior is plastic, you don’t have to worry about fingerprints, smudges, dents, rust or scratches. The inner bucket has an innovative design that hides the liner inside the bin. When you put the liner inside the bucket, there are two handles which you wrap the overhang around. They hold the liner tightly inside the bin. Note that the bin doesn’t have a split design. If you also need a recycling bin, get two of these. Large capacity that is great for busy kitchens. Hides liner overhang inside the bin for a clean look.